Theorists of film and photography, from Barthes to Benjamin, have often drawn our attention to photographic media as a way of accessing history. However, animated documentaries such as Places Other People Have Lived (Yilmaz, 2011), Learned by Heart (Rimminen and Talaka, 2007), Irinka and Sandrinka (Stoïanov, 2007), Silence (Bringas and Yadin, 1998) and Waltz With Bashir (Folman, 2008) show us how animation can function as an alternative way to recall the past. In fact, I think that animation is a representational strategy that is particularly suited to documentaries that explore fragmented pasts of forgotten, perplexing, yet often formative memories. The use of animation can emphasise that history and, importantly, memory, are ephemeral and can be a means to counter official and written histories. All of the films mentioned above are about personal, collective or post-memories – aspects of the past that are often excluded from ‘History’. And memory is a strange and often intangible thing, yet something that is inherently formative in terms of personal identity. Evoking the elusiveness of the past with live-action imagery might lead one to resort to hackneyed effects. Animation, with its multitude of techniques, styles and aesthetics offers a richer way of communicating our complicated relationships with our own, individual and collective, past. Take Irinka and Sandrinka for example: Stoïanov’s short film suggests how collective and postmemory constitutes personal identity as the filmmaker explores, via the memories of an elderly aunt, how she fits into a broader history of the collapse of the Russian monarchy. The film can be thought of as a work of postmemory that seeks to connect Stoïanov to the collective memory of pre-revolutionary Russia, a past from which she has been cleaved by the political history of the Soviet Union and the enforced geographical separation experienced by the older generations of her family. Any presumption of photographs providing a simple or direct access to the history from which Stoïanov feels so removed is quickly dispelled in the film. Instead, collage-style animation layers photographs with images from personal and official archives, along with drawings from children’s books and Stoïanov’s own illustrations and suggests, as Marianne Hirsch says, that ‘postmemory’s connection to the past is thus not actually mediated by recall but by imaginative investment, projection, and creation.’ In Irinka and Sandrinka, Stoïanov imaginatively projects herself as a character – Sandrinka – into her re-creation and animation of her aunt’s memories. 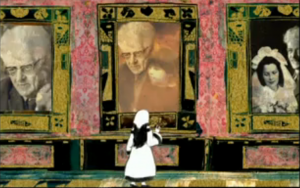 At one point, little Sandrinka stands fascinated in front of portraits of her forebears that hang along an animated hallway of Stoïanov’s ancestral home, mirroring Stoïanov’s own discovery of her past through her aunt (see image). Animation offers seemingly endless ways of engaging with the elusive past. From Waltz with Bashir’s graphic, stylised cut-out animation as a means of director Ari Folman exploring his repressed memory of the 1980s Lebanon War to Silence’s use of different animation styles to evoke the process of enforced forgetting and gradual remembering of Holocaust survival, the potential for the use of animation in autobiographical documentaries about personal history and memory are vast. It may seem counter-intuitive that non-indexical media may be the most vibrant and evocative way of remembering the past. But, the absence of indexical evidence of the past combines with the rich tapestry of animation’s visual excesses, which go beyond merely re-presenting the past, to convey the meaning of both personal history and the act of remembering it. Bella Honess Roe teaches film studies at the University of Surrey in the UK. The ideas discussed above are explored in more detail in her book “Animated Documentary”, in which she examines the implications of animation as a representational strategy for documentary, that will be published by Palgrave Macmillan later this year. [1 Postmemory is a term coined by Marianne Hirsch, in her 1997 book Family Frames: Photography, Narrative and Postmemory, to describe memories not experienced directly, but ‘inherited’ from a previous generation. ← Animation Studies / Animation Stories If Complementary, Animation Studies are not Consensual: Good for Them!